We all know very well that the well-known PUBG Mobile (PlayerUnknown’s Battlegrounds), which was recently updated including a zombie mode based on Resident Evil 2 Remake, continues to add new content to keep its large mass of players active and engaged. 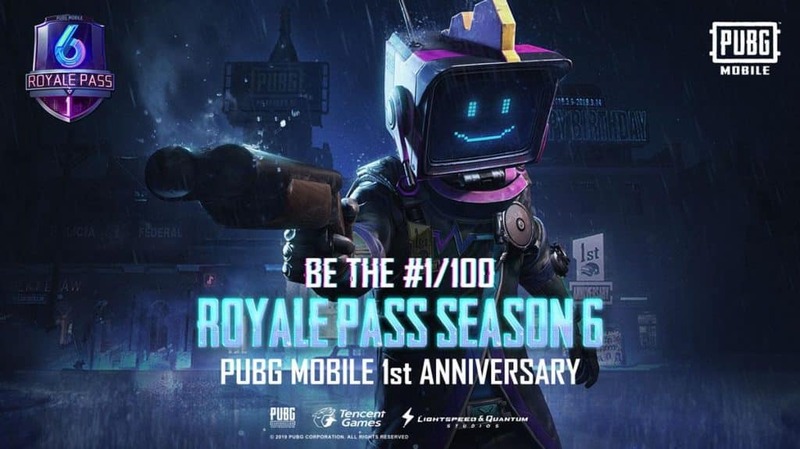 Hence, now the title, which made the Battle Royale genre more fashionable and has more than 100 million active downloads, has been updated to version 0.11.5 that incorporates Season 6, the new Royale Pass Season with more rewards and points, and more developments. The well-known PUBG Mobile (PlayerUnknown’s Battlegrounds), which was recently updated including a zombie mode based on Resident Evil 2 Remake, continues to add new content to keep its large mass of players active and engaged. Hence, now the title, which made the Battle Royale genre more fashionable and has more than 100 million active downloads, has been updated to version 0.11.5 that incorporates Season 6, the new Royale Pass Season with more rewards and points, and more developments. Tencent Games has released a new update for the famous Battle Royale title, of course, PUBG Mobile (PlayerUnknown’s Battlegrounds) that, as indicated on its official website, incorporates the new Season 6 and the Royale Pass Season with more rewards and points as we told earlier. In addition, it also includes a new rifle, a three-wheeled bus, a dynamic climate for Erangel and Miramar and anniversary awards, new boxes and more items to celebrate the anniversary of the game. The new update is now available for both iOS and Android devices, and also brings the subscriptions to PUBG Mobile Prime and Prime Plus. In the same way, users will be able, from now on, to light fireworks during the games and obtain anniversary prizes when collecting boxes in the game. But they are not the only innovations that are incorporated into the title since Tencent has made changes in the way in which items are won in the game. With the Royale Pass Season, users will now be able to earn more reward points through weekly challenges and see RP ratings of the entire region and their friends directly from the pass page. In addition, with the purchase of the Elite Pass Plus, you will get additional rewards and will be awarded instantly 25 ranks. Hence, to celebrate its anniversary, PUBG Mobile now allows players to light fireworks and collect boxes during games, some boxes that get anniversary rewards. In the same way, players can also look for randomly generated birthday cakes that contain a hidden surprise. Among other new features, the 0.11.5 update also adds a new dynamic climate for the Erangel and Miramar maps, the G36C rifle for the Vikendi map and a new three-wheeled vehicle known as Tukshai. Moreover, users can also start subscribing in April to PUBG Mobile Prime and Prime Plus, plans that offer a range of benefits, such as free daily UC, Royale Pass points, an 80% discount on checkout and much more. So, what do you think about this? Simply share all your views and thoughts in the comment section below. And if you like this article then simply do not forget to share this article with your friend and family.